Your next to darkest shade on the head is almost imperceptible on my monitor without zooming way way in. I don't see any difference between removing that color or not. The smaller eyes look better and not as creepy. He still kind of looks like a bat though. Those ears are gigantic. Maybe give him a neck and shoulders to express his pain/fear/neutrality a bit better? Outside of everything mentioned here, I've got nothing else to offer aside from making sure you know that your blacks are still very *very* close together -- no real difference on that black ramp whatsoever, and that extra black-ish color on the top ramp (between the other colors) wouldn't be needed if your black ramp had enough variation in contrast between its color values. I suggest going for clarity and fairly stark differences in your color ramps instead of a set of colors for each thing. That aside, that's all I can really offer. Since the color pallet wasn't diverse enough and had some ugly colors, I decided to change the color pallet. Most of my days off from work both yesterday night and today have been spent redoing the color pallet for my sprites, so hopefully my pallet looks much better now. Can you tell the difference between the two darkest shades just fine? Hopefully the cat's primary fur color still looks black to people. The old eyes did look kind of creepy, especially in my oldest versions. He still kind of looks like a bat though. Those ears are gigantic. Maybe give him a neck and shoulders to express his pain/fear/neutrality a bit better? I'll keep that in mind when I begin work on the character's body. Outside of everything mentioned here, I've got nothing else to offer aside from making sure you know that your blacks are still very *very* close together -- no real difference on that black ramp whatsoever, and that extra black-ish color on the top ramp (between the other colors) wouldn't be needed if your black ramp had enough variation in contrast between its color values. I suggest going for clarity and fairly stark differences in your color ramps instead of a set of colors for each thing. Blackish color as in the dark pink? I can't imagine replacing that with another black. o_O I don't think it would look very good unless I massively redid the ears. Hopefully the grayish dark pink's replacement color looks more distinct from my blacks now. As for additional clarity, hopefully making the darkest shade for the eyes the color orange and the darkest shade for the ears dark red helps with that. I also experimented a ton with the lighter shades for the cat's black fur and felt deviating too much from grayscales made the cat look too much like a different color. I did give the black fur a subtle purplish tint though. I also gave the white fur a bluish tint to make it more distinct from the black fur. You're making a lot of progress, and these have already come a long way, but you could make them even better by addressing a few more issues. Here's a (really messy) edit. I only had time to work on the top two expressions, but you get the idea. -There's a lot of banding going on, mostly concentrated around the mouth. You might be tempted to think that the fuzziness this creates is good way of conveying texture, but in reality it obscures visual clarity and clashes with the shading of the rest of the sprite. The Ramblethread by Helm has a lot of indispensable advice about avoiding banding. -In the topmost sprite, the specular highlight in the pupils is lost in the brightest yellow color next to it, which makes the eyes appear to bulge outward. Try darkening the yellow color so that the specular sticks out as belonging to the pupil. 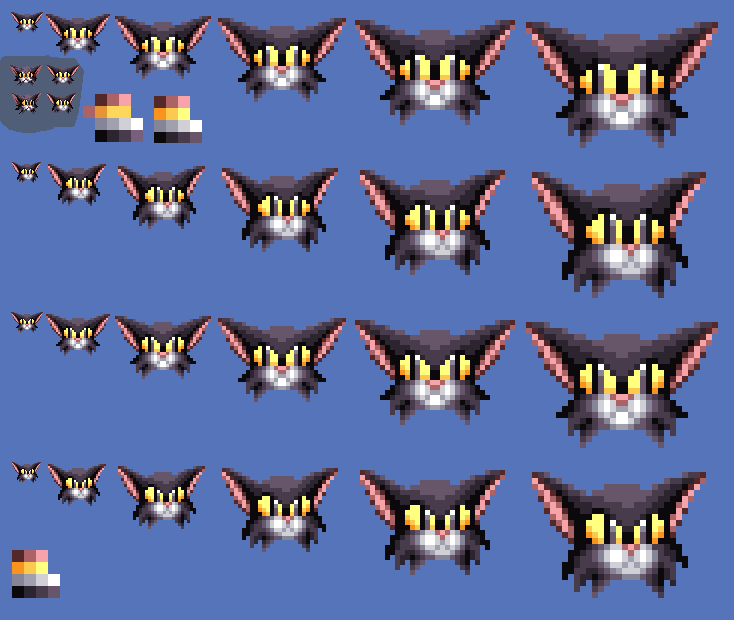 -You've done a good job of improving the palettes as you've worked on this, but the contrast on the darker fur palette could still be upped a tiny bit more. I messed around with other stuff as well, but for the most part the above is all I can think of at the moment. Good luck with your game, and keep up the improvement! New update on my sprites! This was a ton of work. I love, love, love your take on my sprites. Not the style I would go with, but I love it nonetheless. You made my character look a lot older which gives me ideas on what I can do with villager characters. I took your advice and I think you'll be pleased with some of the changes I've done to the mouth area. Good point, so I took your advice on this as well. After the insane amount of work I put into my current color pallet, I wasn't quite up to modifying it again (outside of changes I did to the white fur), but I did a quick color pallet that modifies the color pallet you came up with. Initially, I was going to make the shine purple with my previous update, but feared some people would think the cat's primary color is purple. Though after doing this quick mock-up, I think some of my concerns were a little off. Here is my quick edit. In my eyes, the main problem here is cat's ears. You should find some references and learn from them. Cartoony style is ok, but even cartoons need to follow some realistic aspects to make everything look right. The lightsource is unclear to me, with the sprite appearing to be lit from below and above. I've attempted to fix that in my edit, but I don't think I was very successfull with the cheeks. @BatElite I'm just interested how did you tried to fix shading when you only moved the eyebrows to make cat look more angry. Quite a lot more progress since I last looked at this topic. Looking tons better man. I wouldn't worry so much about the 'primary color' of the cat -- most people associate bluish-purple with black as an alternate color for a highlight because greys usually dull the image and most artists rarely use them without some blue or red mixed in (read as: some color and saturation) to draw out the forms a bit. Really glad you did this in your newest version. And I was referring to that dark pink in my last comment, but making it more saturated helped a bit to distinguish it from your blacks, but this is a case where one of the greys could have worked still because grey absorbs the colors nearby and it would read as 'pink' as its 'color' in this case. It's your choice if you want to fully-optimize your colors though. The additional color doesn't detract from the overall image -- it's just food for thought more than anything. I wasn't saying that his comment wasn't right , I also agree that light source isn't well defined. I just asked how did he tried to fix lighting when he only moved few pixels around cat's eyes. From gif (old version vs edit) you can clearly see that he didn't add any brighter color. @BatElite You should freely make drastic changes in your edits, don't think about succeeding or not, just try to make it as you think it should look. This way you will learn more. Not trying to be a pain, but I think you misunderstood the image sequence he put in his post -- those were two new edited versions of the lighting, not a before and after sequence. The OP wanted some help with ensuring the emotions were different enough as well, so I assume that's why BatElite messed with the eyebrows instead of the lighting -- he just wanted to show his new lighting edit on the face across two different emotional expressions. That being said, it was indeed a pretty big change from the last OP edit (despite using the same set of colors).